For some men, the only piece of jewellery they'll ever wear is a wedding ring, and that seems like a shame, and honestly, kind of a waste. If you're looking for classic jewellery with a masculine edge, then Vitaly is the perfect brand to focus on. 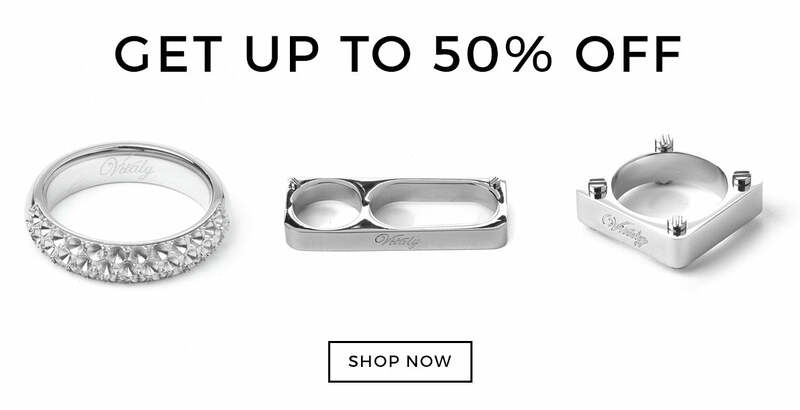 With our Vitaly voucher codes, you can get your hands on some of these clean and elegant pieces at up to 50% off. With our Vitaly voucher codes, you can get yourself a range of unique jewellery at a discounted price. Steering clear of basic shapes and simple finishes, Vitaly embraces the unusual, proving abstract designs that have the perfect balance between striking and versatile. Our Vitaly sale ensures you can get a unique piece of jewellery, and possibly experiment with a new style without having to invest in something too expensive. Men's jewellery doesn't have to be butch skull designs or delicate feminine pieces, and Vitaly easily shows how you can balance two distinct styles to make unique pieces. If you want to know when the next Vitaly sale is happening, or you just fancy 10% off your first order from The Idle Man, then why not sign up to our newsletter? As well as that, if you spend more than £5o on our website you’ll automatically receive free shipping, making sure you avoid those annoying extra costs. If you've got a friend who could benefit from a bit of Vitaly jewellery, then check out our Refer a Friend scheme. All you need to do is share your, for example, Vitaly discount code on social media, or invite your friends via email, and they'll be sent £5 worth of credit. Then, if they spend £30 or more in their first shop, we'll send you £5 worth of credit as well. Spend most of your time in lectures, and have a valid NUS or student card? You should check out our Student Discount page where you can get 10% off Vitaly and many more brands, as well as up to 20% on our special double discount days. Vitaly pretty much started up by accident, when, needing a break from the daily grind, Shane Vitaly Foran made the visit to Ubud, in Bali, and was inspired by the craftsmanship that surrounded him there. It was there that he came up with the design for his first piece - a two-fingered ring made from wood. Back home he created the simple ring, which gained so much interest from his friends that he decided to turn his artistic outlet into a business. Vitaly grew from there and is now a brand that creates gender-free jewellery that anyone can enjoy.